Galerie René Drouin, Paris (by 1949). Riccardo Jucker, Milan (by 1961). Anon. sale, Finarte Casa d'Aste, Milan, 25 November 1980, lot 109. Viktor and Marianne Langen, Meerbusch (acquired from the above, 1984). By descent from the above to the present owners. The Artist's Handlist, vol. IV, no. 637. W. Grohmann, Wassily Kandinsky: Life and Work, New York, 1958, p. 340, no. 637 (illustrated, p. 310). H.K. Roethel and J.K. Benjamin, Kandinsky, Catalogue Raisonné of the Oil-Paintings, 1916-1944, London, 1984, vol. II, p. 966, no. 1075 (illustrated). Kandinsky in Paris, 1934-1944, exh. cat., The Solomon R. Guggenheim Museum, New York, 1985, p. 38. V. and M. Langen, Kunst des 20ten Jahrhunderts: Sammlung Viktor u. Marianne Langen, Ascona, 1986, vol. I, p. 19 (illustrated in color, p. 20). London, Guggenheim Jeune, Wassily Kandinsky, February-March 1938, no. 4. Kunsthaus Zürich, Georges Braque, Wassily Kandinsky, Pablo Picasso, September-October 1946, p. 12, no. 78 (with inverted dimensions). Amsterdam, Stedelijk Museum and The Hague, Gemeentemuseum, Kandinsky, December 1947-March 1948, no. 73. Paris, Galerie René Drouin, Kandinsky: Epoque parisienne, 1934-1944, June 1949, no. 41. Turin, Galleria civica d'arte moderna, La pittura moderna straniera nelle collezioni private italiane, March-April 1961, no. 57 (illustrated). Turin, Galleria civica d'arte moderna, Il Cavaliere Azzurro: Der Blaue Reiter, March-May 1971 (illustrated). Lugano, Museo Cantonale d'Arte, Kandinsky nelle collezioni svizzere, June-October 1995, p. 232, no. 68 (illustrated in color, p. 233). Lugano, Museo d'Arte Moderna, Passioni d'arte da Picasso a Warhol: Capolavori del collezionismo in Ticino, September-December 2002, p. 196 (illustrated in color, p. 197). Surely the most ardently visionary among the founders of modern art, Kandinsky also stands out as a painter with a decidedly intellectual bent, who expressed his thoughts on painting in passionately argued writings that often reveal his ideas to have been far ahead of their time. Indeed, Kandinsky may well have been the most persistent and adventurous explorer of them all--early, mid-career and late--as he sought out and practically single-handed charted previously unknown realms which comprise the spiritual dimension in art, adding vast territories to the widening map of human consciousness in the modern era. Kandinsky's late period, roughly the final decade of his life, began with his move to Paris in late 1933--the Paris paintings are his great late works. The many contrasts of form and content that one may observe between works of the middle and late periods in Kandinsky's career, that is, between the Bauhaus era of the 1920s and early 30s, and the Paris period of later 1930s and early 40s, are immediately discernible when comparing, as an example, the important Kandinsky painting last sold at Christie's New York, Schwarz und Violett, executed at the Weimar Bauhaus in April 1923 (Benjamin and Roethel, no. 698; fig. 1), with the present Pointes noires of March 1937, painted in Paris nearly a decade and a half later. Nearly every element in the 1923 Bauhaus composition was geometrically conceived, and the artist assembled all these parts according to an allied imperative that decreed well-ordered balance and design, to create maximum visual impact. The present Paris painting Pointes noires is, by contrast, dissimilar in almost every outward aspect, apart from the presence of some semi-circular forms and rectangles of various sizes. To peer into Pointes noires--its superficial appearance of flatness notwithstanding, this painting suggests a tantalizingly ambiguous dimension, which opens out like a window onto infinity--is to gaze upon a world that is mysteriously drifting asunder, as if randomly coalescing and dissolving before one's eyes. "Things fall apart; the centre cannot hold," W.B. Yeats wrote in his poem The Second Coming. Kandinsky, before the First World War and the Russian Revolution, shared such a fascination for apocalyptic imagery. There is, however, nothing so remotely fatalistic or doomsday-like in the painting Pointes noires. Kandinsky celebrates in this animated canvas the dazzling abundance and variety of the world, the sublime magnificence of nature in its most extreme places. Pointes noires ostensibly recalls the winter holiday Kandinsky and his wife Nina had spent during early 1937 in Mürren, a mountain village in the Bernese Oberland of Switzerland. To this day Mürren cannot be reached via road; the town lies at the terminus of a narrow gauge railway, from which cable cars ascend to an elevation of more than 5,400 feet (1560 m) above sea level. Mürren offers breath-taking views of three towering Alpine peaks--the Eiger, Mönch and Jungfrau--whose contours in exaggeratedly stylized form Kandinsky has depicted in the present painting. Beginning in 1911 Mürren became an increasingly popular destination for tourism and winter sports. All of these features, together with some of the town's inhabitants and visitors, may be discerned among the imaginative assortment of pictorial forms which Kandinsky employed to compose Pointes noires. Here is the Alpine scene Kandinsky may have viewed through his hotel room during the nearly white-out conditions of a winter snowstorm. The effect is entirely unlike any this artist would have striven to depict using the rigid geometry of his Bauhaus manner during the 1920s. His approach here is far more romantic, more akin to Caspar David Friedrich painting in the Harz mountains, or the paintings J.M.W. Turner based on the watercolors he made during journeys through the Swiss Alps. We are, of course, moreover reminded of the precipitous landscape forms that Kandinsky appropriated and transfigured, during the years immediately preceding the First World War, to create the very first expression of abstract forms in painting. Les pointes noires in their namesake canvas are actually few in number among many others of various colors; the title is perhaps a teasing invitation to seek them out, and in the process appreciate the fullness of Kandinsky's conception. One need not, and Kandinsky himself might well have suggested that the viewer should not, think in terms of a particular locale. Confetti- and streamer-like elements in many shapes and sizes are on the wing, spinning, dancing, and fluttering about as if a strong gust of wind on a blustery March day in Paris has swept them up and scattered them about. This whirlwind will disperse them, like the spores in a bursting pod, far and wide. The contents of this expanding universe may now defy gravity or any other cohesive force, but nonetheless seem drawn toward some unseen, distant but irresistible vortex. The 1923 Bauhaus composition (fig. 1) is a powerfully declamatory statement, the construct of a firmly deliberate and purposefully disciplined mind. The Paris painting, on the other hand, describes what might be likened to the mercurial and fleeting impressions of a brilliant lyric poet--Kandinsky wrote and published a series of poems while in Paris (see K.C. Lindsay and P. Vergo, eds., Kandinsky: Complete Writings on Art, New York, 1994, pp. 809-812 and 836-839). The Bauhaus painting is life projected onto an ideal plane and motionlessly suspended as if in a timelessly classical dimension. This is not a plausibly livable proposition. The Paris painting, however, describes that mingling of both calm and flux that is something nearer to the life we actually lead. "My pictures contain a calm confirmation of LIFE, not of life," Kandinsky wrote to Galka Scheyer on 13 August 1939, during the first weeks of the German invasion of Poland and the beginning of a second great war in Europe. "It is a great relief for me to have achieved this. This was my dream (although I was unaware of it at first). Earlier I wanted more noise, and in 1914, i.e., before the war and revolution broke out, a 'great calm' began to hover before me... Nowadays, this calm 'Yes' holds its own even in the most complicated pictures" (quoted in J. Hahl-Koch, Kandinsky, New York, 1993, p. 331). Whatever "great calm" Kandinsky may have found in the familiar life in art he had been leading at the Berlin Bauhaus suddenly came to an end in 1933. Following the success of the Nazi Party in the national elections of January 1933, Adolf Hitler, their leader and the newly appointed chancellor of the German government, had already begun seizing far-reaching autocratic powers to enable his political, economic and racial agenda, when his Storm Troopers shut down the Berlin Bauhaus on 11 April. Negotiations to reopen the school failed, and the Bauhaus was declared permanently defunct on 20 July. While vacationing in France that summer, Kandinsky and his wife Nina decided they must leave Germany, prepared their move and arrived in Paris on 21 December. The couple rented a modestly sized three-room apartment on the sixth floor in a new building overlooking the Seine in Neuilly, a western suburb of Paris. The artist furnished his new residence to resemble his erstwhile quarters in the Dessau Bauhaus during the late 1920s. Here, cramped as it was, he made his new studio; the relatively low height of the ceilings, typical in modern apartments, would constrain the size of his paintings, but he nonetheless painted canvases that were actually taller than those he had created at the Bauhaus. Like many others, Kandinsky and Nina preferred to believe the distressing events they had recently witnessed back home were only a passing aberration. "We are not leaving Germany for good," the artist wrote to Will Grohmann on 4 December 1934. "I couldn't do that, my roots are too deep in German soil" (quoted in op. cit., 1958, p. 221). He and Nina hoped to return to Berlin within a year or two. In 1937, however, Nazi authorities ordered fifty-seven works by Kandinsky removed from German museums, of which fourteen were included in the infamous Entartete Kunst (Degenerate Art) exhibition that opened in Munich later that year. When both Kandinsky's and Nina's German passports expired in 1938, and Nazi embassy officials refused to renew them, they sought French citizenship, which was granted the following year, only weeks before the beginning of the Second World War. The first paintings that Kandinsky created in his small Neuilly apartment during 1934 reveal certain aspects of continuity with works he had done in the Berlin Bauhaus during the previous two years. He had begun to curtail his reliance on geometrically conceived forms, enabling the emergence of a greater variety of shapes, many more noticeably irregular and organic than any he had created for more than a decade, in motifs that generally became smaller in size and more plentiful on the canvas. He might still organize and align these images, like birds on a wire, on a slender grid--the only significant holdover from the Euclidean syntax of his Bauhaus period--but more often he would now allow them to take flight and soar freely across an open and unstructured ground. "It was the amorphous," according to Christian Derouet, "the unexpected that now tempted him" (exh. cat., op. cit.. 1985, p. 34). The impact of Kandinsky's new French surroundings soon became apparent in his painting, beginning with the very first important canvas he painted there in March 1934, Montée gracieuse ("Graceful Ascent"; Roethel and Benjamin, no. 1033; fig. 2), which Jelena Hahl-Koch described as "the arrival of a personal springtime" (op. cit., 1993, p. 332). 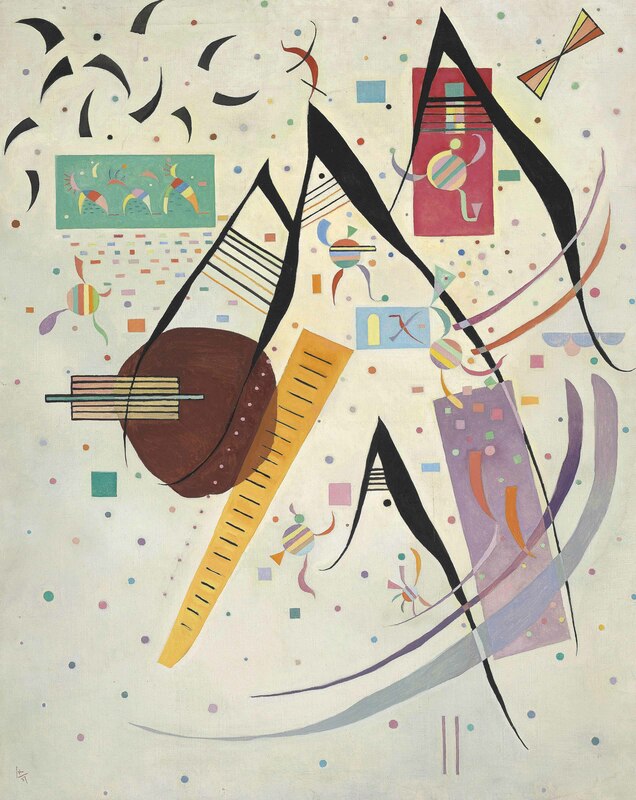 "The move to Paris totally altered my 'palette,'" Kandinsky wrote to Galka Scheyer on 19 May 1935. "Work is going wonderfully well here. The Paris light is very important to me, although it stopped me from working for two months when I first arrived, because it had such a shattering effect on me. The difference in light to central Germany is enormous--here it can be simultaneously bright and gentle. There are gray, overcast days, too, with no rain, which is rare in Germany. The light on these gray days is incredibly rich, with a varied range of color and an endless degree of tones. Such a quality of light reminds me of the light conditions in and around Moscow. So I feel 'at home' in this light. At the other extreme, I love the light in Bavaria where it's like 'thunderbolts,' illuminating great chasms, and always 'fortissimo'" (quoted in ibid., p. 356). "In every truly new work of art a new world is created that has never existed. Thus every true work of art is a new discovery; next to the already known worlds, a new, previously unknown one is uncovered. Therefore, every genuine work says, 'Here I am!' Abstract art renounces subjects and their reformulation. It creates forms in order to express itself... To my mind this creative path must be a synthetic one. That is to say, feeling ('intuition') and thought ('calculation') work under mutual 'supervision.' Thus next to the 'real' world abstract art puts a new world that in its externals has nothing to do with 'reality.' Internally, however, it is subject to the general laws of the 'cosmic world.' Thus a new 'world of art' is placed next to the 'world of nature,' a world that is just as real, a concrete one. Personally, then, I prefer to term so-called 'abstract' art concrete art" (in K.C. Lindsay and P. Vergo, eds.,op. cit., pp. 831 and 832). Kandinsky, during his final decade, lived to paint (figs. 2-7). According to Vivian Endicott Barnett, he completed in his Neuilly studio 144 oil paintings, around 250 watercolors and gouaches, and numerous drawings (exh. cat., op. cit., 1985, p. 26). "The works of the Paris years have been described as expressing a superior synthesis," Grohmann has written. "In Kandinsky's language, this would mean that they reflect a union of head and heart, of compositional technique and intuition, but also branching out toward other sensory experiences, particularly toward music, and even a symbiotic relationship with scientific thinking" (op. cit., 1958, p. 227). The lastly named phenomenon to which Grohmann referred is Kandinsky's employment of new sources of imagery in his Paris paintings, which he derived from scientific and encyclopedic publications, giving rise to what is perhaps the most remarkable and unexpected component in the appearance of his late works. "The new motifs the artist introduced in 1934," Vivian Endicott Barnett has written, "...derive from the world of biology--especially zoology and embryology... There is a remarkable incidence in his painting of amoebas, embryos, larvae and marine invertebrates, as well as leaf forms and punctuation marks." Kandinsky subjected these life forms to "his fanciful and imaginative stylization." Barnett has surveyed and analyzed, in this light, the imagery in various works Kandinsky painted during the early Paris period, 1934-1937, also indicating those publications which the artist is known to have owned or likely consulted (see exh. cat., op. cit., 1985, pp. 62-87). "Abstract art, despite its emancipation, is subject here also to 'natural laws,' and is obliged to proceed in the same way that nature did previously, when it started in a modest way with protoplasm and cells, progressing very gradually to increasingly complex organisms. Today, abstract art also creates primary, or more or less primary, art organisms, whose further development the artist can predict only in uncertain outline, and which entice, excite him, but also calm him when he stares into the prospect of the future that faces him. Let me observe here that those who doubt the future of abstract art are, to choose an example, as if reckoning with the stage of development reached by amphibians, which are far removed from fully developed vertebrates and represent not the final result of creation, but rather the 'beginning'"(in K.C. Lindsay and P. Vergo, eds., op. cit., p. 628). The circumstances that marked the second half of Kandinsky's residency in Paris, encompassing the early war years and the Occupation with its privations, during 1939-1944, were hard on the artist and his wife. Canvas was difficult to obtain, and except on small format panels and canvas-boards the artist largely gave up oil painting after mid-1942, working mainly in gouache and tempera instead. Kandinsky completed L'élan tempéré, the last oil painting he recorded in his Handlist, during March 1944, before becoming ill and showing symptoms of severe arteriosclerosis, which led to his death in December. Kandinsky used nature as the springboard for his development of abstraction in the years immediately prior to the First World War, gradually shedding like Salomé her veils the semblance of representational appearance to reveal the naked form of absolute painting beneath. The perilously difficult ascent of the steep mountain crag became a personal allegory for his conception and development of abstract painting. Afterwards, during the Bauhaus years, nature may still be experienced, but hardly translated as seen; Kandinsky consistently minimized or even eliminated any tell-tale sign by coolly employing a purely geometrical pictorial vocabulary. In Paris, however, the artist arrived full circle, returning to nature once again for his most direct inspiration and guidance, and painting this fact directly into his canvases. Even in a grandly mountainous environment such as that he depicts in Pointes noires, in which he might well have summoned forth the "chasms" and "thunderbolts" of his pre-1914 march to abstraction, he prefers instead to express this scene in micro-scale, as he peered ever more deeply into the miraculous existence of the simplest and most rudimentary life forms. It is in these origins, even in the lives of single cells, that Kandinsky ultimately discovered the true spiritual meaning in life and art that he had been seeking all along, "the confirmation of LIFE" of which he spoke to Galka Scheyer. And this he found revealed in all the generations that have come before and all that are to follow. It is in this wondrously universal totality, he learned, that the flame of life burns most clear and pure. Kandinsky demonstrated in his life, his writings and his art that he was a man of uncommonly deep feeling. This artist was profound in this thought and prophetic in his insight. In the annals of 20th century art, there was no else like him. He was in an empyrean league all his own.